First of all, I know. I’m terrible at this blogging thing. I really am. If it’s not an assignment, it doesn’t seem to get done. At any rate, I’m coming up on my 40th birthday next month, and trip plans are well underway for what is shaping up to be a pretty memorable adventure. I honestly can’t recall what on earth I did for my 30th birthday, which is kind of sad, but I won’t forget my 40th. This, I’m already sure of. The husband & I will be at Mont-Saint-Michel off the Normandy coast for three nights, including my actual birthday. 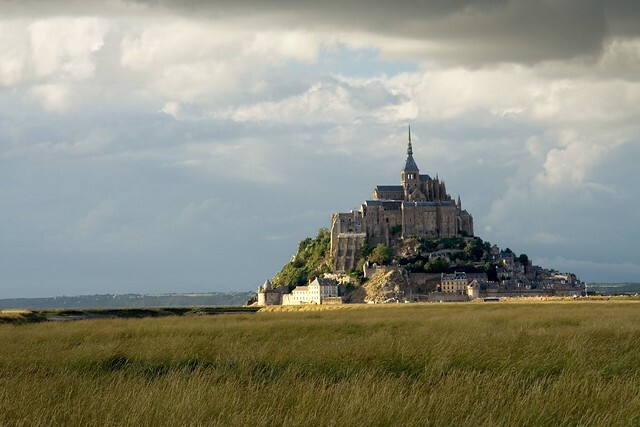 I have wanted to see Mont-Saint-Michel for – literally – 22 years. TWENTY-TWO YEARS, PEOPLE. I saw the movie “Mindwalk” my freshman year of college, & ever since then I’ve been obsessing over it. I had a near miss in 1999 when we got as far as the D-Day beaches on a day trip from Paris before realizing that it was a Sunday, the train & bus schedules were totally lame, & we were never going to make it there & back in time. I cried. Right there, in the tiny train station in I-don’t-even-remember-what-town, I cried. We made the most of the day we could, visiting the D-Day beaches, the cemeteries, and the lovely town of Bayeux, so the day wasn’t a loss – but I can still feel the raw emotion of that defeat in the train station. This time, things will be different. This time, we’re renting a car, driving our asses straight to Mont-Saint-Michel upon our arrival in France, & checking into an auberge for three glorious nights. I can’t begin to explain how much this means to me. After Mont-Saint-Michel, we’ll spend a week in Paris before heading home, another year wiser (& probably fatter). I love Paris, but it’s been ages since I was there (1999), so I’m hereby taking any & all recommendations – restaurants, bars, shops, whatever – for your Paris favorites. Send ’em my way! Had a great trip to Mont-Saint-Michel back in 2010. Such a wonderful place. I wish you the best on your trip there.